Background: The aim of this work was to compare water and organic extracts, infusions and tinctures from flowers and leaves of Calendula officinalis in terms of their biological activity and composition. The purpose of work was investigation whether the leaves and stems are really the waste or they contain interesting substances which could be utilized. Antimicrobial, antifungal, antioxidant and anti-inflammatory activities were studied. Then, the ability to inhibit collagenase was studied as well. Cytotoxicity was tested for all the samples on mammalian cell lines. Methods: To determine the composition of extracts, infusions and tinctures phytochemical analysis (the set of colour reactions for the detection of groups of biologically active compounds) was carried out and showed that samples from flowers and leaves contain the same groups of biologically active substances (proteins and amino acids, reducing sugars, flavonoids, saponins, phenolics, terpenoids, steroids, glycosides). The antimicrobial activity of tested samples was proved, where the most sensitive bacterium was Micrococcus luteus and the most sensitive yeast was Geotrichum candidum. Results: The study of anti-collagenase activity has shown that the enzymatic reaction of collagenase was affected by all tested samples and their effect was concentration dependent. Cytotoxicity of water and methanol extracts at cell lines HEK 293T and HepG2 was observed. Conclusion: Cells HepG2 were more sensitive than cells HEK 293T. Using cell line RAW 264.7, antiinflammatory activity of all samples was observed. Tincture of leaves was the most effective. Keywords: Calendula officinalis, antimicrobial activity, mammalian cells, phytochemical analysis, anti-colagenase activity, cytotoxicity, anti-inflammatory activity. Keywords:Calendula officinalis, antimicrobial activity, mammalian cells, phytochemical analysis, anti-colagenase activity, cytotoxicity, anti-inflammatory activity. 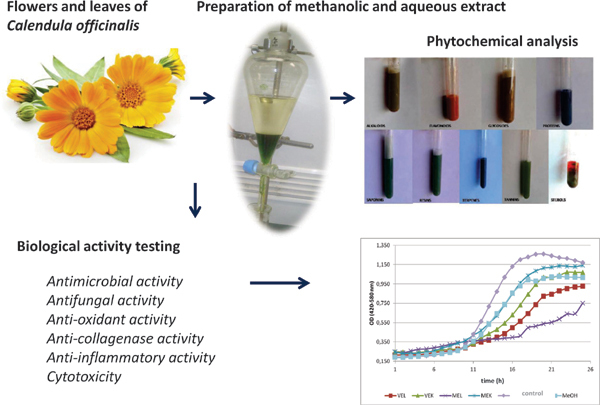 Abstract:Background: The aim of this work was to compare water and organic extracts, infusions and tinctures from flowers and leaves of Calendula officinalis in terms of their biological activity and composition. The purpose of work was investigation whether the leaves and stems are really the waste or they contain interesting substances which could be utilized. Antimicrobial, antifungal, antioxidant and anti-inflammatory activities were studied. Then, the ability to inhibit collagenase was studied as well. Cytotoxicity was tested for all the samples on mammalian cell lines.